I am not much of a beer drinker, so I am not sure why I gravitated to this recipe, but I am glad I did. It is a really simple weeknight meal that can be made in less than 30 minutes. The sauce is a combination of beer, honey, whole-grain mustard, and soy sauce. It is a great combination of sweet, salty, and tangy. I think you could probably use any beer here but I used Blue Moon, since that was within my limited knowledge of beer. It is light and refreshing, so it does not overpower the sauce. The original recipe did not include marinating the chicken, but since chicken can be dry I thought that might help. Blue Moon is usually served with a fresh orange slice so I used the zest and juice of an orange in the marinade along with the beer. Now I have five Blue Moons in my refrigerator. Combine the orange zest, juice, dry mustard, ¾ cup of beer, garlic, 1 Tb vegetable oil, and salt and pepper in a bowl, whisk. 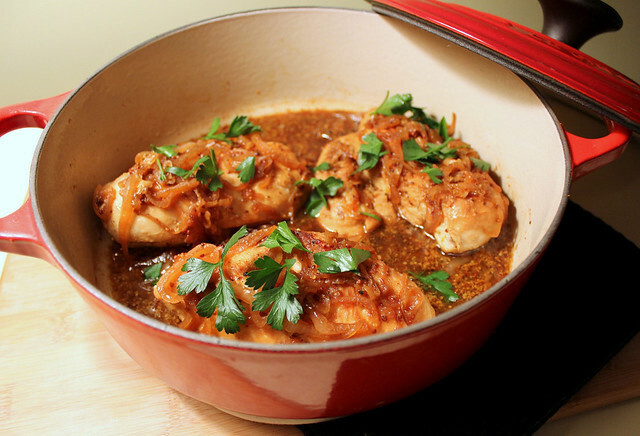 Pour the marinade over the chicken and marinate in the refrigerator for at least 30 minutes. Place the remaining vegetable oil (1 tablespoon) a large skillet over medium heat. Remove the chicken from the marinade and season with salt and pepper on both sides, to taste. Sauté the chicken in the pan until brown on both sides and almost cooked through, about 5-8 minutes on each side. Remove the chicken from the pan and set aside, keep warm. Add the shallots to the pan. Use the shallots to scrape up most of the browned bits on the bottom of the pan. Cook until caramelized, about 5 minutes. Meanwhile, combine the remaining ¾ cup of beer, soy sauce, mustard, and honey in a small bowl, whisk to combine. Once the shallots have caramelized add the mustard mixture to the pan, stir to combine scraping up any remaining browned bits. Add the chicken back to the pan and simmer until the chicken is cooked through and the sauce has thickened. Serve garnished with parsley.